As of June 1st 2018, the Mac App Store will require all apps to support 64-bit, in advance of this after you update to macOS 10.13.4 the first time you open a 32-bit app you will see the following alert. If you press the “Learn More” Button it takes you to the apple.com website which explains. A similar approach was used in iOS warning users that an app was 32-bit eventually ending support for 32-bit apps in iOS 11, Apple has said the same strategy will be employed as 32-bit macOS apps become obsolete. The announcement was made by Apple at the 2017 June WWDC that 32-bit apps will no longer be supported after macOS High Sierra (10.13). Indeed, apps that do not support 64-bit already seem sluggish in comparison to their counterparts which do support 64-bit. 64-bit architecture allows apps to use more memory for one as well as newer hardware that only supports 64-bit and so 32-bit apps use a form of emulation. 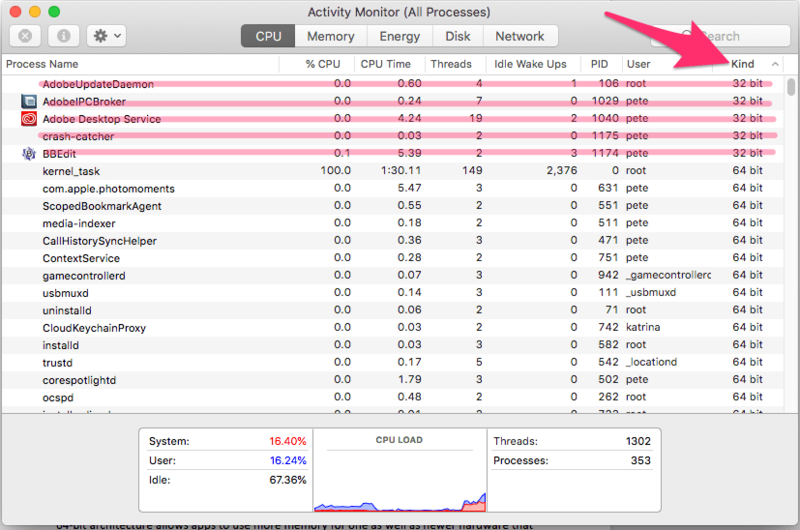 You can see which apps you have running that are 32-bit by opening the Activity Monitor from Applications > Utilities. And then sort by the “kind’ column. You will need to make sure that apps you use have a 64-bit version available before updating to macOS 10.14 which should be released in the fall of 2018.